Collecting log files from other programs. Copying configuration files so you can inspect to see if the right values were replaced. 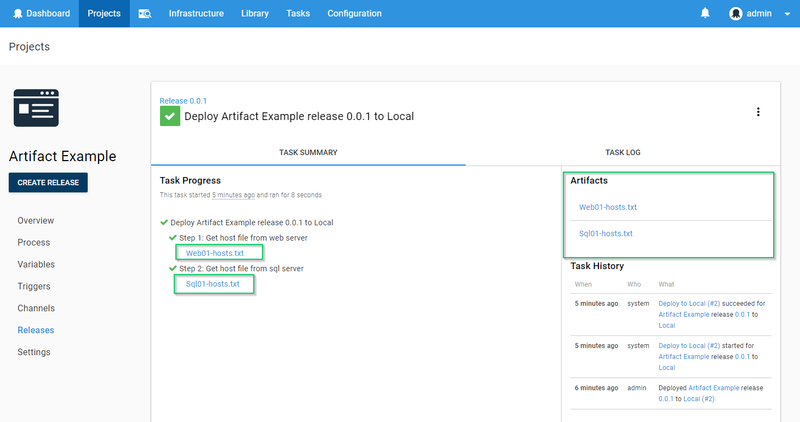 Artifacts can be collected from anywhere that Octopus runs scripts - for example, the Script Console, or custom scripts in a deployment. After the script runs the files will be uploaded to Octopus Server and made available as deployment artifacts which are available for download from the task output, or via the Octopus API. You can collect artifacts using any of the scripting languages supported by Octopus. In each scripting language you can specify the path to the file you want to collect as an artifact as an absolute path, or a path relative to the current working directory. By default, the file name will be used as the artifact name, but you can provide a custom name for the artifact as an alternative. New-OctopusArtifact -Path "C:\Windows\System32\drivers\etc\hosts" -Name "$([System.Environment]::MachineName)-hosts.txt"
If you want to collect a file as an artifact, your script must be able to access and read that file. In most cases, files produced by your deployment were produced in the same security context as your running script, and everything will just work. In some cases you may want to collect certain files from the operating system which require elevated privileges, or perhaps a special user account. If you are using the Tentacle agent, make sure the Tentacle process is running as a user account with access to the file. If you are using an SSH connection, make sure the SSH user account has access to the file. Artifacts are collected by Octopus as-is to maintain the integrity of the files. If the files you want to collect contain sensitive information you should take care to scrub or mask that sensitive information before telling Octopus to collect the artifact.